Kim Kardashian Cheated With Chris Brown on Kanye West – Wedding Being Called Off? Uh, oh. 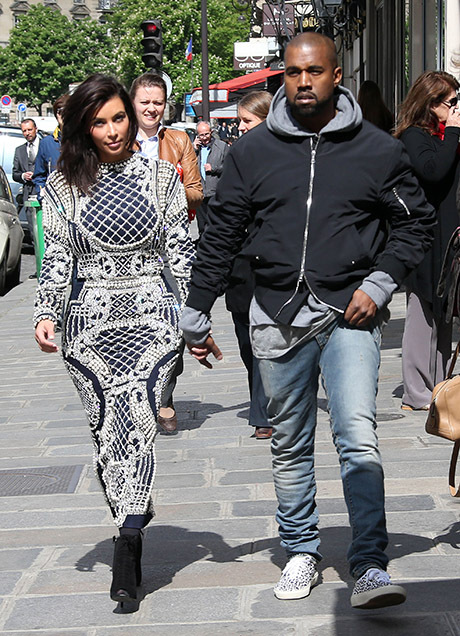 We might have to call off Kim Kardashian and Kanye West‘s wedding sooner than we thought! In a new story published in the latest issue of Life & Style, it’s alleged that Kim and Chris Brown underwent an affair just after Kimye became an item in 2012. The strangest part is that it’s all just coming to light, which has many people scratching their heads. If an affair between Kim and Chris — two incredibly high profile celebs — really did go down, then how in the world are we (who pride ourselves on being extremely snoopy) just hearing about it now? “The word is out,” says an insider for the mag “and Kanye is not just embarrassed, he’s furious. [When West] confronted Kim about her relationship with Chris, she denied it.” This alleged insider says that now West doesn’t believe anything she’s saying and Chris Brown is bragging about his hookup with the reality show diva. Yikes. This sounds like a mess — or just one super ridiculous story. Chris definitely seems like the type of guy with whom Kim might like to hookup, but I have a hard time believing this particular event occurred. What do you think? Do you think Chris B and Kim K actually hooked up? If they did, and if Yeezy continues to spiral out of control, do you think he’ll call off or postpone the wedding? Wow, we’re basically hyperventilating now. Because we need this wedding to happen. Kanye West Boycotts Fashion Industry, Demands he be Treated like the GOD he is!